Since the 1960s, the Congolese have endured over two decades of armed conflict with over 5.4 million people dead due to war-related causes, making it the deadliest conflict since World War II. Congolese armed groups and elements of the army have a long, brutal history of recruiting child soldiers. The United Nations report at least 1,000 cases of child soldier recruitment between January 2012 and August 2013. The oldest national park in Africa is the Congo’s Virunga National Park. It is home to rare mountain gorillas, lions, and elephants. The park is currently under threat by the UK oil company, Soco, which has begun oil exploration there. In the DRC, only 1.8% of existing roads are tarred and less than 10% of the population has access to electricity today. 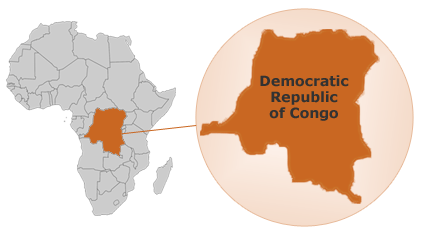 Recently there have been pushes to improve, including the announcement of a $1 billion package from the World Bank for infrastructure.The Democratic Republic of the Congo hosts the United Nations’ largest peacekeeping mission in the world, with over 21,000 soldiers from approximately 50 different countries. Due mainly to the ongoing instability in the eastern part of the country, about 450,000 refugees from the DRC remain in neighboring countries, particularly Burundi, Rwanda, Tanzania, and Uganda. The DRC is among the most resource-rich countries on the planet, with an abundance of gold, tantalum, tungsten, and tin – all minerals used in electronics such as cell phones and laptops – yet it continues to have an extremely poor population. Tin, tungsten, tantalum, and gold have been dubbed “conflict minerals.” Armed groups use the profits from sales for campaigns of violence. Some companies are becoming more accountable by tracing their supply chains. Former NBA All-Star Dikembe Mutombo was born in the Democratic Republic of the Congo. In 1997, he founded a humanitarian foundation to improve the health, education and quality of life for the people in the DRC.